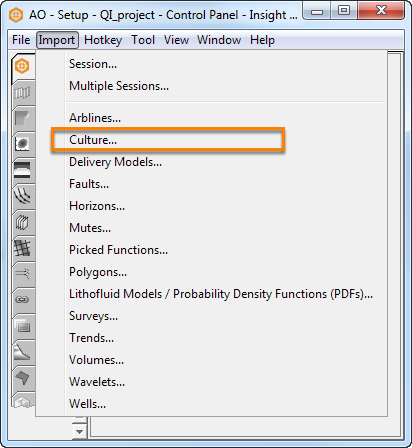 When importing culture, Insight can convert culture coordinates to the project coordinate reference system. Note: Some image formats other than GeoTiff (including georeferenced jpg / png) require manually entering coordinates to position the image. Go to Control Panel > Import menu. The Coordinate Reference System conversion window will be displayed. Click Convert from to select the CRS in which the culture file is defined. Coordinates will be converted from this CRS to the project CRS. The project CRS is defined when you create a project (see Creating a Project). Click OK to process the conversion. Note: If you are importing multiple culture files at the same time, the same conversion is applied to all files. Next: How do I create a custom coordinate reference system (CRS)?